All the essentials—and more—for keeping you safe on the road! 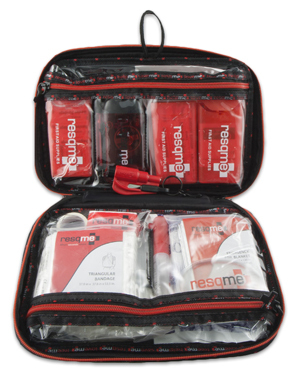 The Essentials Deluxe Kit from Resqme contains many of the first aid items and safety tools that you need to keep your family safe in the event of an emergency on the road. This handy kit includes all of the essentials that you’d expect in a first aid kit—like adhesive bandages, triple antibiotic ointment, tweezers, and gauze—with the added benefit of the Resqme difference. The Essentials Deluxe Kit from Resqme includes the original Resqme car escape tool, a battery-free crank flashlight, emergency whistle and more! The Essentials Deluxe Kit is conveniently packed into a premium carrying case that can be tucked into nearly any glove box, center console, or storage pocket. The Essentials Deluxe Kit from Resqme contains over 130 FDA/CE approved items to aid you and your passengers in the event of an emergency. 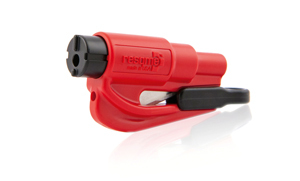 The Resqme Original Keychain Car Escape Tool can break glass and cut seatbelts in the event of an emergency on the road. When an emergency happens, you want to be prepared so that you can remain calm and address the situation. The Essentials Deluxe Kit from Resqme gives you the peace of mind of knowing that all of your first aid and emergency essentials are conveniently contained in one place. When travelling, it can be rather inconvenient to pull off the highway in an unfamiliar place and find a drugstore every time there’s a problem. The Essentials Deluxe Kit contains all of the first aid essentials that you need to tend to stuffy noses, scrapes, small cuts, abrasions, aches, and pains. If there is a more serious situation, like a car accident or mechanical problem, the Essentials Deluxe Kit contains the original Resqme tool that can cut through stuck seatbelts and break glass, a crank flashlight equipped with 2 LED bulbs to light the scene without the use of batteries, an emergency whistle to help signal for help, a reusable hand warmer, and an emergency blanket. The Essentials Deluxe Kit from Resqme contains 139 FDA and CE approved items that can help you and your passengers in the event of an emergency. The included first aid guide will help you better manage nearly any emergency situation with all of the necessary first aid materials close at hand. The Essentials Deluxe Kit contains 134 first aid items plus five potentially life-saving tools all in an easy-to-carry premium zippered case. The Essentials Deluxe Kit from Resqme makes an ideal gift for new drivers, frequent commuters, or anyone else that regularly travels by car. Emergencies happen, be prepared with the Essentials Deluxe Kit from Resqme. Seems like a well put together kit to have around, lucky for me I haven't had to use it yet.